It hasn't been easy for Jacob Faria to attract attention. The right-hander lasted until the 10th round of the 2011 Draft, and that was the year Tampa Bay had a record 12 selections in the first two rounds. "I was the Rays' 20th overall pick," Faria said. It's been impossible, though, to not look at what he has done with the Charlotte Stone Crabs this season. Faria was the first pitcher in the Minors or Majors to reach double figures in victories, and he had a Florida State League-best 1.33 ERA to go with his 10-1 record after 12 starts. Still, the 21-year-old hasn't cracked the Rays' Top 30 prospect list yet, although he has to be close. Faria, selected for the FSL All-Star Game, isn't concerned about that, anyway. "I try not to look at it too much," he said. "Numbers will speak for themselves. I don't worry about rankings and stuff like that." That's all part of his improved mental outlook. Baseball isn't all physical. "I'm a substantially better pitcher this year, and it's because of the mental side," Faria said. "I used to try to strike everyone out. Now I just concentrate on throwing strikes to the catcher's glove." Faria is also better able to focus when he isn't on the mound. "I used to think about things that didn't matter," the California native said. "Stuff got in my head. Now I can shut that out." Faria's improved focus was shown when he went up against rehabbing Miami Marlins ace Jose Fernandez in back-to-back starts against Jupiter. He won his 10th game in the first meeting, then threw seven scoreless innings the second time as Charlotte won in extra innings to clinch the first-half title in the South Division of the Florida State League. "It was cool getting to pitch against him," Faria said. "He was really good the second time, but we still won. It was a lot of fun." It has mostly been all good this season for Faria, whose only loss came May 4 at Jupiter. He's allowed just five earned runs over 35 2/3 innings in his last seven starts. Faria features a four-seam fastball that sits around 92 mph, a curveball and a changeup. He is working on the side with a cutter for next year, but he's already tough to hit. He had 63 strikeouts to 22 walks in his first 74 1/3 innings and opponents were batting just .199. His WHIP was 0.98. Faria, a standout at Gahr High School in the Los Angeles suburb of Cerritos, had committed to Cal State Fullerton, and he might have turned down the Rays' bonus offer if the Titans hadn't been going through a coaching change. He spent three seasons in Rookie ball but showed flashes of what was to come in the Midwest League a year ago. Then came the breakthrough with the move from Class A to Class A Advanced this year. Charlotte's pitching staff had a dominant 2.30 ERA through 63 games, but Faria was the best of the best. How long he stays with the Stone Crabs remains to be seen. Gahr has produced eight Major Leaguers. The last was Kris Medlen, trying for a comeback with Kansas City after two Tommy John surgeries with Atlanta. Faria, of course, would like to join the list. "Kris donated a new scoreboard for the school," Faria said. "I've never met him, but I'd like to." Faria more resembles Jered Weaver, the Los Angeles Angels pitcher he grew up following. Weaver, though, has had his ups and downs this season. Faria has had nothing except ups. Leiter moved up: Clearwater right-hander Mark Leiter was promoted to Double-A Reading by the Philadelphia Phillies after going 3-1 with a 1.97 ERA in 14 games, the last eight of them starts. The son of the former Major League pitcher of the same name and nephew of Al Leiter ranked fourth in the Florida State League in ERA and was third with a WHIP of 0.95. Leiter, 24, had 60 strikeouts to 15 walks in 68 2/3 innings, and opponents were batting .202 against him. 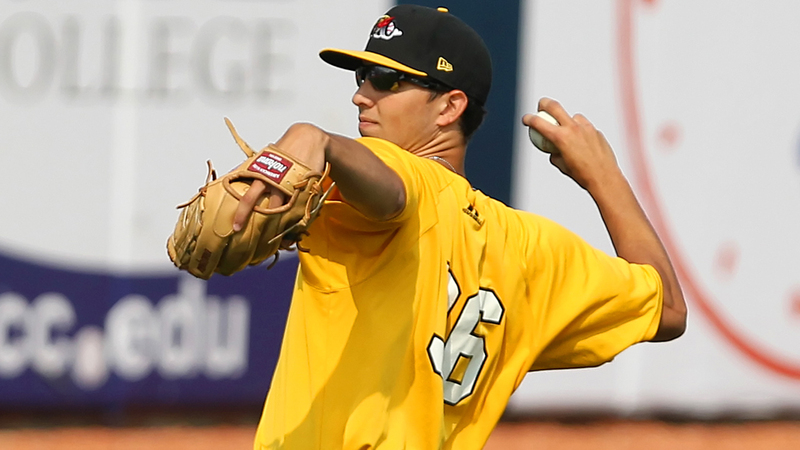 He was a 22nd-round choice of the Phillies in the 2013 Draft out of New Jersey Institute of Technology. Browning returned: Right-hander Wil Browning, who was leading the FSL in saves when promoted to Double-A in mid May, was returned to Dunedin by the Toronto Blue Jays after a rough outing for New Hampshire on June 6. He bounced back for a save in his first game back with Dunedin on June 11, giving him 11 conversions in 12 opportunities. Browning had 23 strikeouts to one walk in 17 2/3 innings with Dunedin and his ERA was 0.51. In Browning's absence, Charlotte righty Brad Schreiber took over the saves lead, converting his first 16 opportunities. Lyman promoted: Right-hander Scott Lyman, second in FSL in wins and ERA, was promoted from Jupiter to Double-A Jacksonville by the Miami Marlins. He won six straight decisions to improve to 7-1 and had a 1.61 ERA over 11 starts for the Hammerheads. His only loss came April 17 at Bradenton, and he allowed no more than one earned run in any of his next eight starts. Opponents batted .192 against the 25-year-old former UC Davis pitcher, who was a 10th-round Draft choice by Miami in 2011. Lyman was 5-11 for Jupiter last season.